Whether you’re new to DIY moves or performed several of them, the team at Mobile Truck Rental have what you need to ensure an easier, safer and more affordable move. Our 3 tonne Pantech trucks are a smart choice for both personal errands or commercial jobs and the best thing about them is that you don’t need a truck licence to drive one! If you have a C class open licence, then you’re good to go! What’s more, our entire fleet is automatic as well, so even those without experience operating a manual will be right at home. For a remarkable deal on removal truck hire throughout Newcastle, get in touch with the good folks at Mobile Truck Rental now on 1300 799 317, simply fill out our quote form, or email us directly at info@mobiletruckrental.com.au . With other rental companies, it’s up to the customer to collect the vehicle at the commencement of the rental period and deliver it back to the nearest yard, at the end of the lease. With Mobile Truck Rental, we take care of this for you. We deliver your truck to your address at the agreed upon time and collect it from you at your new location, at the conclusion of the lease. It’s extremely convenient, saving you time and money and allowing you to concentrate on the move itself. No matter what industry you’re in, customer service plays a big part in influencing a person’s decision to refer your company to friends and family and to seek out your services again, in the future. For this reason, the team at Mobile Truck Rental stop at nothing to ensure that customers are treated to a five star truck rental experience, from start to finish. From the moment you make your booking, to the time we come and collect the rental from you at the end of your lease period, we do everything to ensure your utmost satisfaction. Get in touch with us today and experience the Mobile Truck Rental difference. Our removal trucks have been specially engineered to tackle the rigours of transferring heavy equipment, safely and securely. Our vehicles are decked out everything you need to get your gear to their new location, including rope, trolley and rear tailgate lifter. Additionally, the air-conditioned cabs come fully loaded with the latest technologies and creature comforts, including a CD/MP3 player. Customer safety is our greatest concern and this means ensuring that all trucks undergo routine maintenance checks. Trade certified mechanics ensure that each vehicle is always in perfect working order. Beyond this, every truck is professionally cleaned inside and out after every use, guaranteeing all rentals are kept in immaculate condition. Each truck has enough storage capacity to carry 20m³ worth of equipment in a single haul, which equates to the size of a typical 3 bedroom unit. Our removal trucks have been designed to make the loading and unloading of equipment as effortless as possible, helping to reduce the likelihood of strains, sprains and any other personal injuries. The smart design also helps to prevent accidental damage to your belongings. If it’s your first experience with a DIY mover, we suggest you cast your eyes over our handy guides on lifting heavy objects and loading and unloading to prevent unnecessary injury. Our personalised removal truck hire deals represent outstanding value for money and our concierge delivery and retrieval services provide the ultimate convenience. Contact our friendly team now and see how much you stand to save by doing a DIY move with Mobile Truck Rental. The best thing about moving with our 3 tonne trucks is that you don’t require a truck licence to operate one. A valid open C class licence is all that’s required to drive one. They may be slightly larger than what you’re used to driving, but once you get the hang of them, you’ll quickly realise that they’re just as easy to drive. That being said, if you haven’t driven one before, we’d still suggest that you take the time to familiarise yourself with them, by reading our driving tips guide, to help ensure a safer and more enjoyable experience. 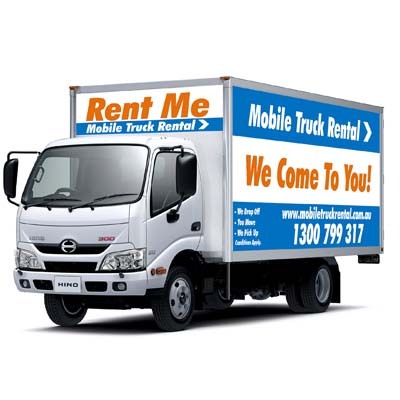 At Mobile Truck Rental, we make Newcastle removal truck hire affordable. Our vehicles are all immaculately clean, maintained and serviced on a frequent basis and come fully equipped with all the gadgets you need to perform your transport duties in total comfort. Competitive rates with no hidden charges. Avoid paying outrageous sums of money to have a removalist do the work for you. Do the smart thing and Hire a Newcastle removal truck. You’ll be saving yourself a small fortune by doing so and our super convenient service ensures that you don’t have to waste time and money driving to the rental site to collect your vehicle or driving to another one when you reach your final destination.